Life Water and Vitamin Water are two popular flavored waters that come in a variety of flavors. Life Water is manufactured by a beverage company owned by Pepsi, named SoBe. Vitamin Water is produced by Glaceau, a bottled water company. Life Water comes in 8-oz. and 12-oz. bottles. Vitamin Water is available in 12-oz., 16-oz., 20-oz. and 22-oz. bottles. Vitamin Water comes in 12 flavor combinations whereas Life Water has 16 different flavors. They are cherimoya punch, strawberry dragonfruit, yumberry pomegrante, fuji apple pear, mango melon, black and blueberry, acai fruit punch, agave lemonade, orange tangerine, strawberry kiwi, pomegranate cherry, blackberry grape, blackberry dragonfruit, strawberry apricot, macintosh apple cherry and strawberry kiwi lemonade. Vitamin Water flavors include dragonfruit, raspberry-apple, kiwi-strawberry, orange-orange, tropical citrus, black cherry-lime, lemonade, fruit punch, berry-cherry, grape-blueberry, acai-blueberry-pomegranate and blue agave-passion fruit-citrus. Although both Life Water and Vitamin Water contain vitamins, the specific vitamins and percentage vary by flavor. For example, all flavors of Vitamin Water include 40 percent of the daily value of vitamins B3, B5, B6 and B12 in a 20-oz bottle. All flavors, with the exclusion of dragonfruit, orange-orange and blue agave-passion fruit-citrus, contain 100 percent of vitamin C requirement. Dragonfruit, orange-orange and blue agave-passion fruit-citrus, contain 120 percent of the vitamin C. Most flavors produced by Life Water contain 25 percent of B6 and B12; Fugi apple pear has 20 percent. However, the amount of Vitamin C varies significantly. Strawberry kiwi lemonade and machintosh apple cherry have as little as 25 percent whereas mango melon has 300 percent. Life Water drinks do not contain significant amounts of vitamin B3 or B5. There is no caffeine in Life Water of any flavor but Vitamin Water's tropical citrus energy drink contains 50 mg of caffeine. All flavors of Life Water and Vitamin Water contain electrolytes. The amount of electrolytes per 20-oz. bottle varies. Sodium content in Life Water is between 50 mg and 60 mg but the amount of potassium ranges from as 50 mg to as much as 95 mg, with the exception of machintosh apple cherry and strawberry kiwi lemonade which provide 190 mg of potassium. 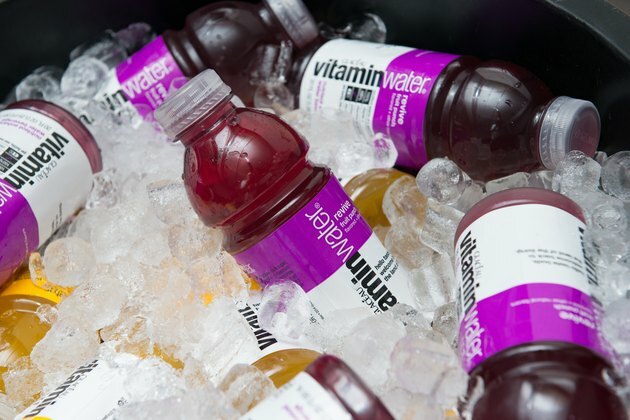 Vitamin Water contains 150 mg per 20-oz. bottle and no sodium. All flavors of Vitamin Water contain 32.5 g of sugar and 150 calories. Although not all flavors of Life Water contain sugar, they all have calories. Acai fruit punch, black and blue berry, cherimoya punch, fuji apple pear, macintosh apple cherry, mango melon, strawberry dragonfruit, strawberry kiwi lemonade and yummy pomegranate have zero sugar. All other flavors have a sugar content between 23 g and 25 g per 20-oz. bottle. Caloric content is 100 for most flavors. Acai fruit punch, black and blue berry, fuji apple pear, macintosh apple cherry mango melon, strawberry dragonfruit, strawberry kiwi lemonade and yummy pomegranate have 10 and cherimoya punch has 5. Is Glaceau Vitamin Water Bad for You?